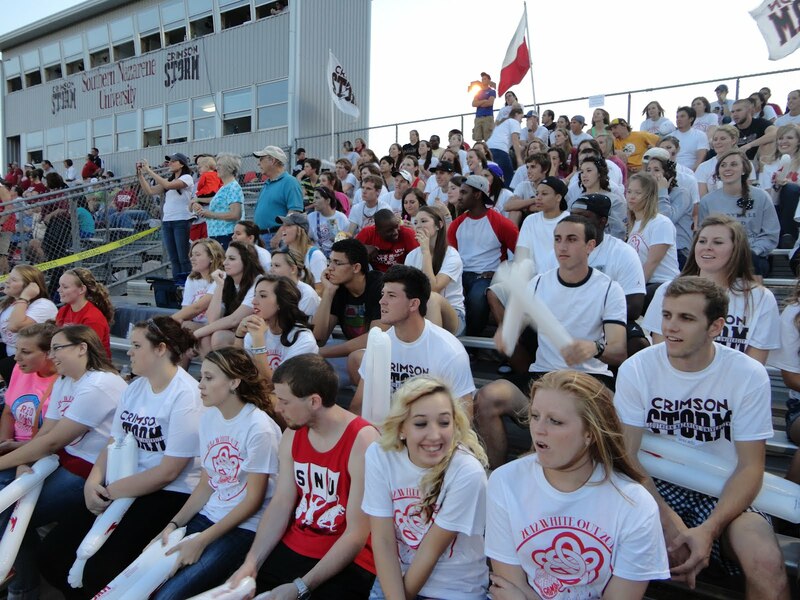 SNU has a new student group, and they are taking athletic events by storm. This “pep club” is referred to as “The Weathermen.” Under the leadership of the Athletic Relations council, they attend sporting events and actively support the teams. The Vice President of Athletic Relations this year is Jared Webster and his council members are Joel Frees (junior), Brady Allred (sophomore), Ethan Fruehling (senior) and Corbyn Holliday (freshman). The Weathermen are responsible for getting as many people to come out and support the sports teams as they can. They are even planning special costume nights for different events. Before the school year began, a handful of students were selected as a starting point for the Weathermen. Even though some have already been picked for the job of Weathermen, anybody who wants to become a part of the revolution is invited to participate. The first official gathering of Weathermen took place at the first home volleyball game where they dressed as, of course, weathermen. Some wore suits and took on the professional look while others decided to take the goofy route and just wear umbrella hats. There wasn’t a huge turnout, but those who did show up definitely made their presence known. With only two home football games this year, the Weathermen had to take advantage of every opportunity. They assisted in the tailgate before the game. The theme for the night was white-out. They asked everyone that came to wear white t-shirts and even gave out a few to those who showed up early. There was a much better turnout than the volleyball game, and almost every student there was on his/her feet for most of the game. This is just the beginning of something that looks to become a pretty big part of the campus life here at SNU. If you would like to get involved in any way, you can contact Webster or any member of the Athletic Relations council.